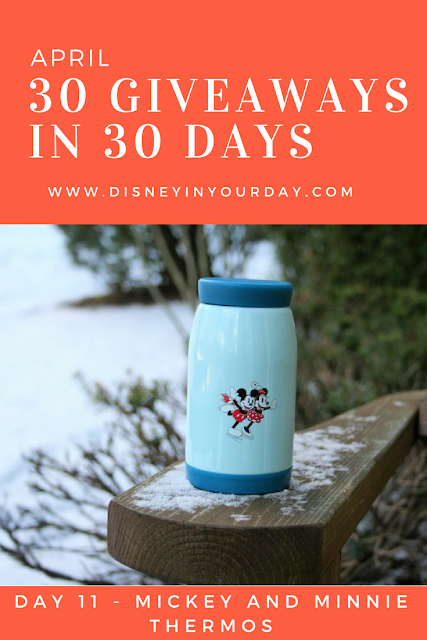 In order to celebrate her birthday, our friend Becky over at Disney in your Day is hosting a special Disney Giveaway every day in April! We thought this was the coolest birthday celebration idea so we are helping to promote two days of giveaways right here on Picturing Disney! This adorable thermos might be more appropriate for winter, but it is adorable and sturdy enough to use every day! Here in New York we are so tired of the cold but sipping out of such a cool thermos will keep us drinking hot tea through all the seasons! This item was exclusive to the Funko Disney Treasures box, so you can’t get it anywhere else except this giveaway. You have until April 19th to enter. Prizes will be mailed out once all 30 winners have been selected. Adorable thermos. I entered. Fingers crossed I get to carry Disney with me all the time! What a nice thought! Good Luck! Perfect for hot tea or cocoa! Good luck!